At age 18 I was given the opportunity to broaden my experiences by studying and working in the private health care field as a Qualified Mental Health Professional in Texas, US. In my role as a Mental Health Professional I offered community support – through interventions and coping strategies – to individuals with a diagnosis from the DSM-V. After eight years of working in the private system, I returned to the UK, where I am a graduate student working in the NHS and supporting service users through mental health crises. My experiences have allowed me to explore the impacts of the public and private systems, where I have made three key findings in regards to private healthcare. It was only upon my return to the NHS that I recognised how fortunate I was to have such eclectic and bountiful resources to work with. Waiting lists were at a minimum, with same-day appointments readily available. Options for medications were in abundance (as long as insurance companies agreed to pay for mentioned medications) and psychiatrist follow-up appointments scheduled regularly for medication reviews. When one was able to access support, they received a copious amount of different services: community support, day-centre activities, on-campus gym services and nutritional assistance – all contributing to creating a holistic approach to mental health. The NHS attempts to replicate such approach, but in my role I have found resources to be more limited and the waiting lists to be lengthy, resulting in both patient and clinician frustration. The benefit of having unlimited resources is overshadowed by the limited time allowed to support a patient. In Texas, mental health patients receive the care that their insurance is willing to cover, and I found that this resulted in a large number of relapses, due to continual care not being provided. Medications had to be changed regularly due to insurance companies failing to pay for a particular drug that may have risen in costs. This resulted in inconsistency in the lives of those suffering with mental illness, a phenomenon less seen in NHS services where provision of care is based on individual need and level of community support. In the private healthcare model, an individual must have a recognised DSM-V diagnosis to ensure the insurance company will fund their treatment. Because of this, there is a focus on labelling the cluster of symptoms experienced. ‘Tick box exercises’ could result in inaccurate conclusions, and in turn ineffective care being delivered. Furthermore, private healthcare requires an individual to already be exhibiting diagnosable symptoms prior to receiving support, resulting in no preventative measures being taken to reduce the outbreak of mental health crises. This is very different to Health Secretary Matt Hancock’s current emphasis on ‘prevention is better than cure’ – a tactic that will arguably reduce health spending costs in the long-term. In my view, the daunting aspects of private healthcare – lack of prevention and inequality of care provision – outweigh the positives around resources. I find the thought of having to insure your body the same way you insure your phone a chilling concept, where our social class could affect the provision of the healthcare we receive. But is this the way the NHS is heading? 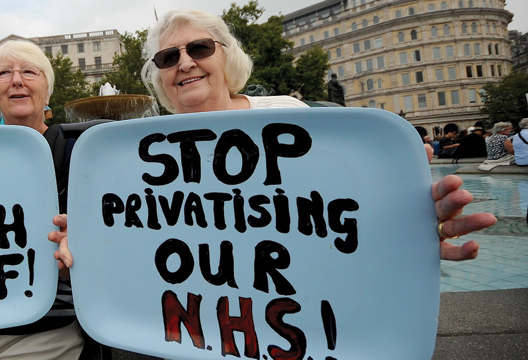 The argument that our health service is an unsustainable model – outdated, over-run, understaffed and underfunded – could result in the slow creep toward privatisation. I would love to hear from current NHS professionals: what are you doing to ensure the worst impacts of privatised healthcare do not travel across the pond?